Are you interested in learning leadership skills that will benefit you for the rest of your life? Do you want to participate in community service and make your local area a better place to live? Would you like to show prospective colleges and universities that you are a well-rounded student with more than academic interests? If you answered yes to even one of these questions then AGS (Algha Gamma Sigma), a CA statewide Honor Society, is right for you! What do we do?In AGS, we believe it is for the betterment of our community and ourselves to devote time towards lending help where it is needed and improving community life. We join together with various local organizations and volunteer in a variety of ways – tutoring children and cleaning up our beaches, even assisting at the campus childcare center are just a few examples. Members can also talk about AGS in class rooms and get points! Points members might need to inform include: (1) Explain about what AGS is (a CA statewide Honor Society). (2) Emphasize that their transcript is officially stamped when they are a member of AGS. Colleges love that! (3) Talk about past experiences the club has allowed you to have (volunteer for the Special Olympics, Habitat for Humanity, Beach Clean-ups, but make it personal). (4) Explain where the club meets. 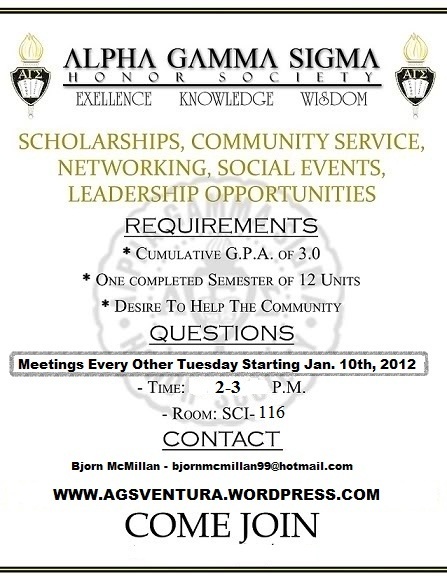 (5) How to join: 3.0 GPA requirement, where to get the application. (6) Explain that all the information about AGS can be found in the AGS Website: agsventura.wordpress.com. (7) Pass around a paper with a column for their name and email address and specify for them to print neatly so they can be emailed more information. Now that you know the fundamentals of AGS please browse the rest of our site to find out how AGS began, view our calendar of upcoming events or view photos of past events, learn how to join and where to download an application.